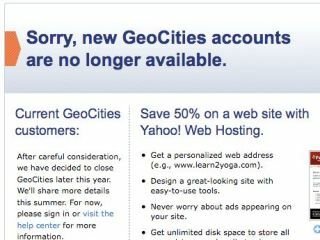 Today marks the end of a web era – Yahoo's free website service GeoCities closes its doors. The web might be a better-designed place these days, but still GeoCities has a place in many hearts – check out today's xkcd redesign to mark the event (pic below). So what's happening about the sites? Yahoo has encouraged all remaining GeoCities members to upgrade to the paid-for Yahoo Web Hosting but has partnered with the Internet Archive to ensure as many GeoCities sites are preserved as possible. So why does the service still hold such fond memories? Slashdot's Rob Malda reminisces: "Geocities is a crazy landmark on the history of the internet. At first it marked a serious bar lowering for access. Before GeoCities, hosting required technical skill and/or money. So if you [didn't have the skills], you were locked out from a real voice on the web. GeoCities made it so easy that anyone could do it. And then everyone did." "GeoCities had very significant impact in enabling people to start publishing on the web," remembers Tristan Nitot, President of Mozilla Europe. "The learning curve was still a bit steep, but it was much easier than before. The initial success of Geocities showed that there was a need to be catered for." Shauna Wright, of Lokion Interactive, also started her site on GeoCities. "I used it as an "about me" vanity sort of thing," she recalls. "I liked GeoCities because its various "neighbourhoods" made it seem like a big party." Computing sites, for example, were in the SiliconValley neighbourhood, while WestHollywood had sites about movies. "It was also a great place to start for a newbie since it required no knowledge of HTML or FTP servers, and as I recall it had a pretty simple user interface. It really made the jump easy for people who would otherwise have had to spend a long time learning how to put a website together." "I remember when Geocities wasn't owned by Yahoo and I probably set up my first homepage during spring of 1997," adds Rick Lippiett, Art Director at creative agency Skyron. "At that time it was pretty much the only way you could get yourself a free homepage online without paying someone hosting fees. It also introduced an internet novice to the simple theories of hand-coding HTML (and tables), uploading files via a simple FTP, creation of graphics and a whole host of digital methodologies that have stood me in good stead over the last 12 years." "My strongest memory of GeoCities was that it was a sort of web ghetto for people who didn't know how to or didn't want to bother to get their own URL and ISP," says web design guru Lance Arthur (glassdog.com). "It did not, as I recall, offer any tools or help, or if it did they were the sort of tools and help that were unhelpful. Its main advantage was cost, being that it was free." Opera's Web Evangelist Bruce Lawson recalls that he didn't understand the appeal at first. "When I was living overseas in the late nineties, a colleague of mine published his diary on a GeoCities site. 'What an egomaniac', I told friends. Why on earth does he think that anyone would want to read his website? [But later] I was teaching a class of primary school children in Thailand and we put up a class website: a photo of us all and each student wrote an introductory sentence about themselves. We emailed the link to a school class in Peru, who did the same in return. It felt very space-age." GeoCities began as Beverly Hills Internet by David Bohnett and John Rezner in 1995. After introducing many new neighbourhoods and rebranding, GeoCities was the fifth most popular site on the web in 1997 and third in 1999. Going public in 1998, Yahoo bought the lot in 1999 for an incredible $3.57 billion in stock. "My clearest memory is nearly choking when I heard what the sale price was and thinking, 'Now, why didn't I think of setting up a few servers, hooking them to the web, divvying up the hard drive space, giving it all away with ads plastered all over it and calling it groundbreaking? '," says Lance Arthur. "I thought Yahoo was supremely stupid to pay that much for relatively useless drivel that no one I knew ever visited. I mean, $3 billion? Billion? With a 'B'?"